The year is 1900. 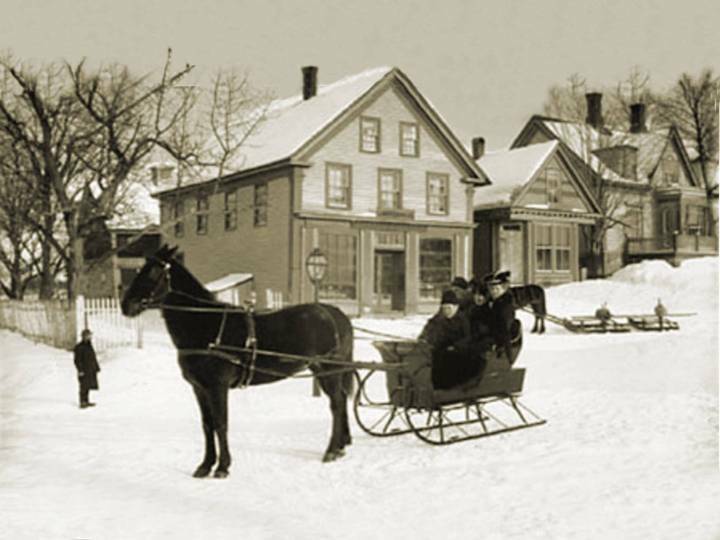 This Christmas season, we’ve had no shortage of snow sleighs. 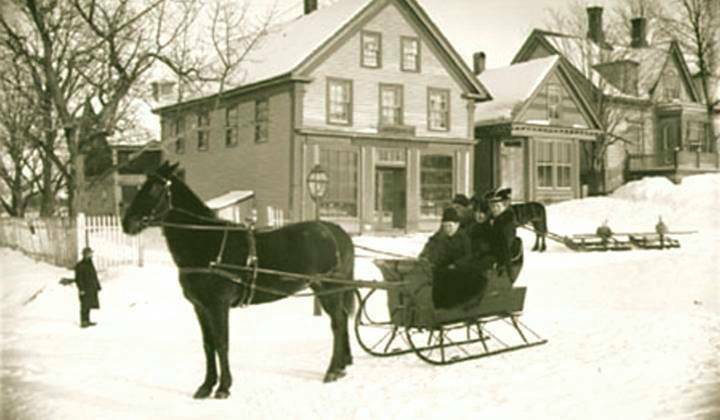 And today is another in a series of horse-powered open sleighs. Opting for a Christmas card stylized approach, lightly-falling snow and chimney smoke have been added to this wintry scene. In addition, the decision was made to extend the roof on the building at left – which also meant extending the sky and trees. Sometimes, I’ll extend the backgrounds in client photos, to center the subject better or provide dimensions that are compatible with standard picture frames. If you’ll look closely at the colorized image, you’ll see that I’ve added a glow to the street lamp, in the tradition of Thomas Kincaid. We’re including another stocking stuffer for you, after our Christmas advertisement. So don’t scamper off too quickly! 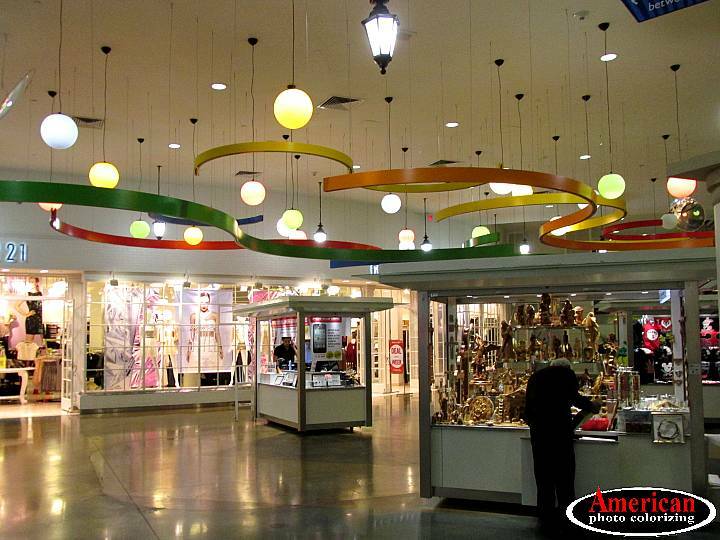 We were strolling through Pacific View Mall last Christmas season, and came upon a very cool kiosk, operated by Jerry and his wife, Lorice from Bethlehem . 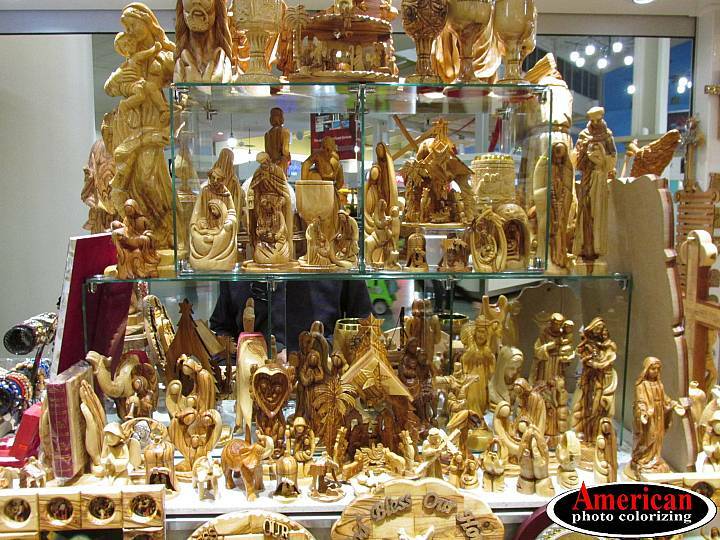 . . yes, THAT Bethlehem. 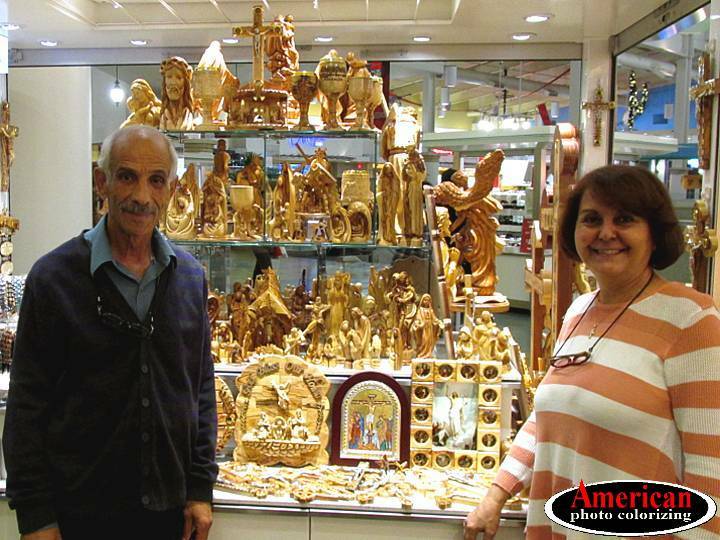 Jerry is an artisan near the Church of the Nativity, where he fashions exquisite manger scenes, and other Christianity-related handicrafts from olive wood. 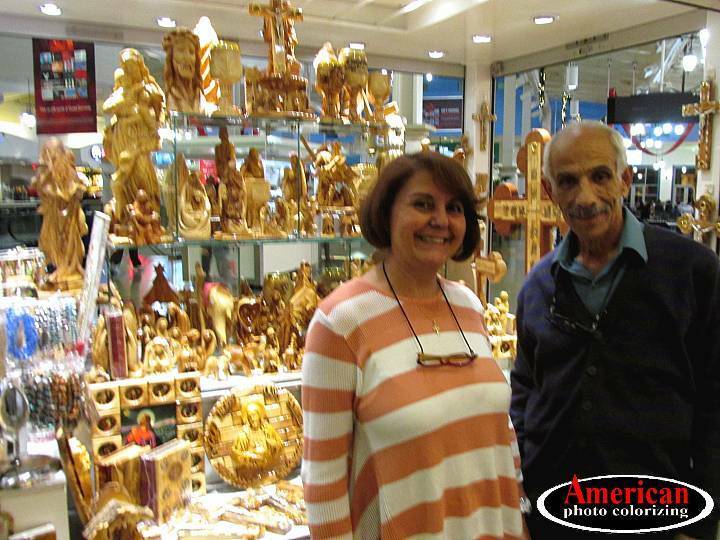 The couple are Palestinian Christians living in Bethlehem. Their family goes back many generations in the City of David. They are such delightful people, we couldn’t resist hanging out with them at their little shop. Being Christians, ourselves, Sheryl and I prayed over them. Before we headed for the food court and teriyaki chicken – Lorice extended an invitation for us to stay at their home, should we ever come to Israel. How cool that would be! 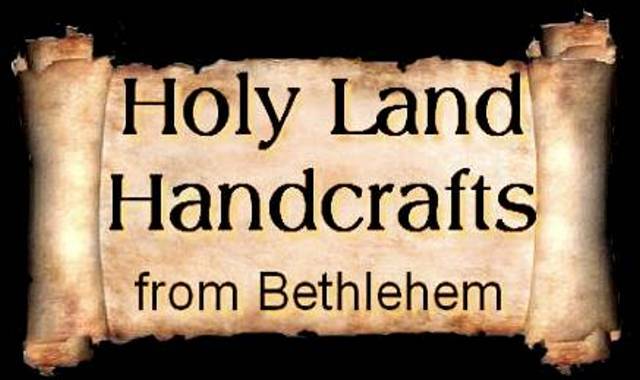 This year, another artisan from their group in Bethlehem, Johnny, is running the kiosk – and he’s very nice, as well. 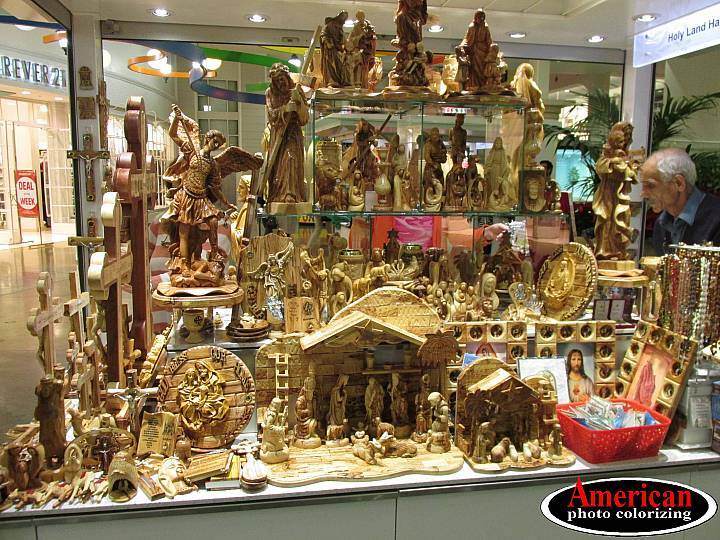 This year, we purchased a very nice olive wood nativity scene for a fraction of what these kind of products go for. 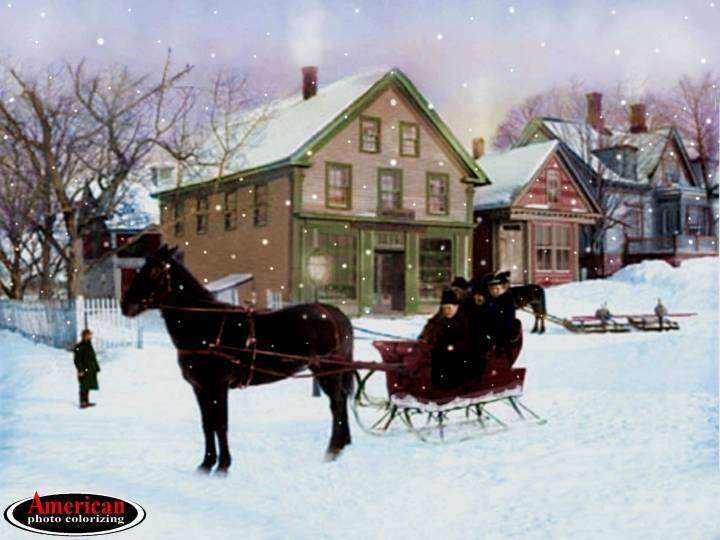 This entry was tagged 1900s, American Photo Colorizing, Antique.Photos, Bethlehem, Christmas, Christmas Eve, Colorized Photos, Nativity, One-Horse Open Sleigh, Photo Colorization, Photo Colorizing, Sleigh Ride, Snow. Bookmark the permalink. 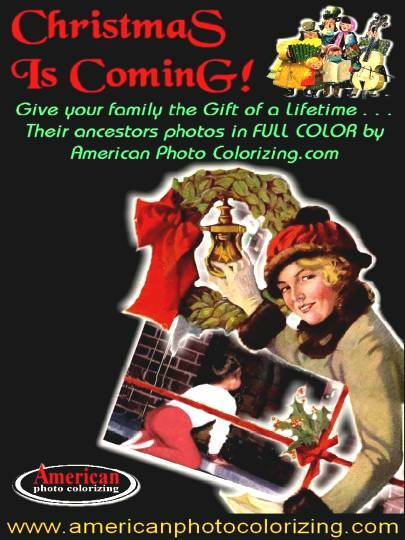 ← 10 Open Slots For Colorized Photo Orders Guaranteed In Time For Christmas 2015!